The ESV Daily Devotional New Testament is designed to help people become familiar with the central message of the gospel as it guides them through reading the entire New Testament in one year. 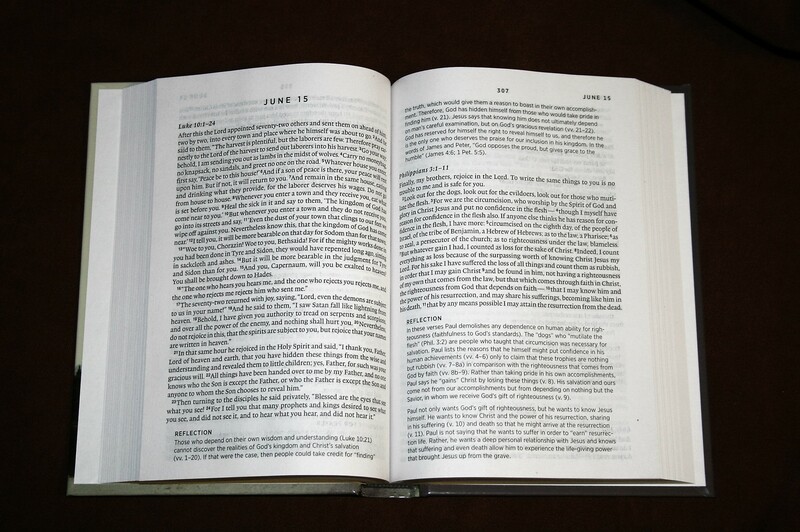 The devotionals have been adapted from the ESV Gospel Transformation Bible. It is available in hardback, paperback, and e-book formats. 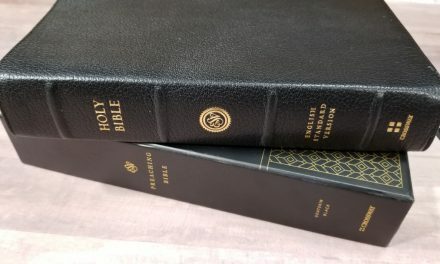 Each day has two readings, one from the histories (Matthew-Acts) and one from the Epistles (Romans-Revelation), a reflection on each reading, and then an excerpt from Psalms and a Thoughts for Prayer that ties the two readings together. The readings are divided up nicely. 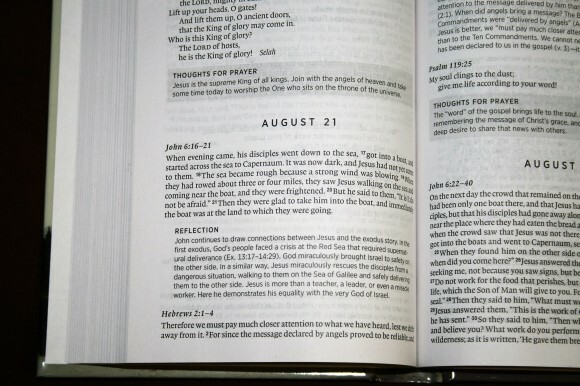 They don’t stop in the middle of a passage and make it hard to understand the point but keep the daily readings uniform enough in length to make planning time for them simple. The reflections were well thought out, informative, and sometimes thought provoking (even to someone already familiar with their Bible) but they did sometimes contain a theological slant. 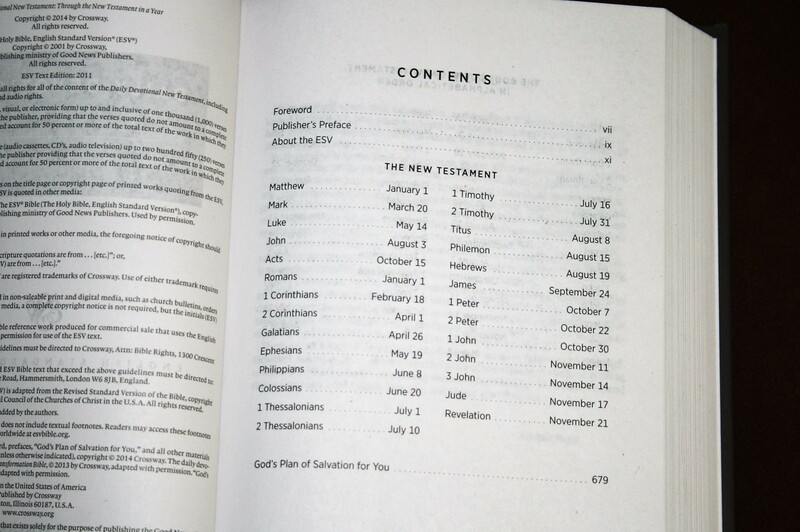 Since the readings are done in biblical order I wish the Table of Contents had included the page each book of the Bible started on as well as the day. 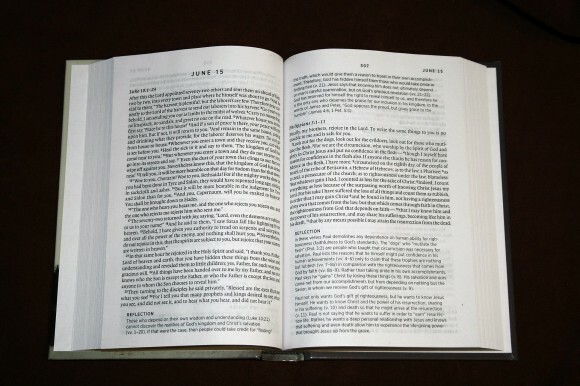 This would have made it easier to use as a regular New Testament if the need had arisen. 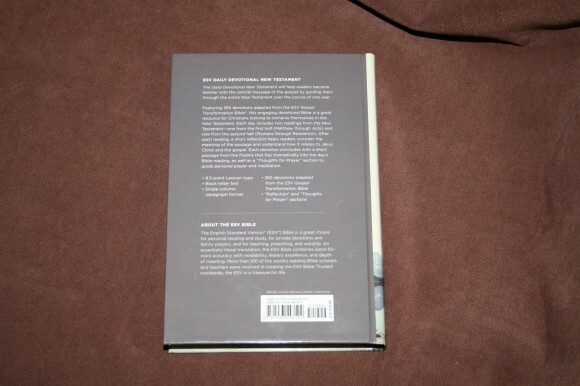 Some people would find the print small (8.5 point Lexicon type) but that allows the book to be on the small side; 5″ x 7.3″ , an inch thick in hardcover, just over 1/2inch thick in paperback. I don’t have any problems reading smaller print and I prefer it this way since it is easier to carry with me or fit on a crowded nightstand. 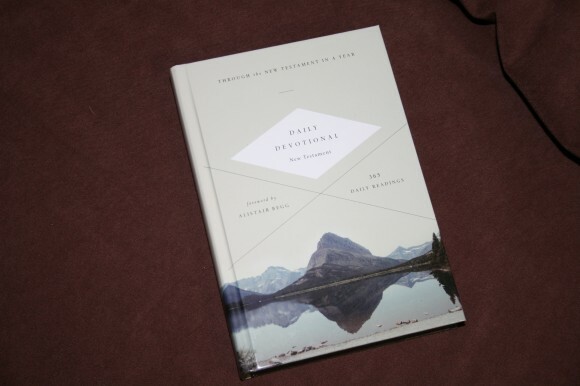 I really like the way this devotional is laid out, how it ties different parts of the New Testament (and even the Old Testament) together as one message from and about God, and how it encourages application to our daily life. I recommend it with the caution to always take the Word of God over notes and devotions. Crossway proved this Bible free for review. I was not required to give a positive review- only an honest review.